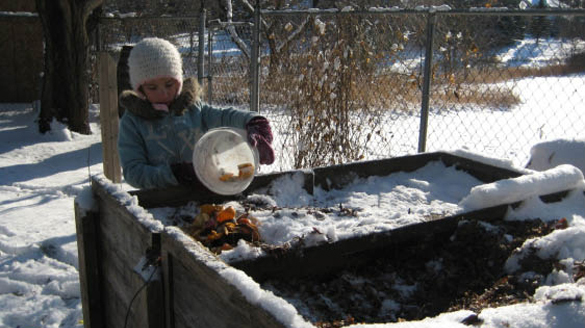 Winter composting – To layer or not to layer? As we head into the deep freeze and crave the goodness of warm homemade soups and casseroles, the food scraps keep piling up. Because of the intensity of our cold, the decomposition of organic matter slow considerably and most micro-organisms are in hibernation. Although deep inside the pile some critters are still hard at work, sadly, the pile will not shrink down and marinate as is does so nicely in the summer. But there’s a bright side to this story. 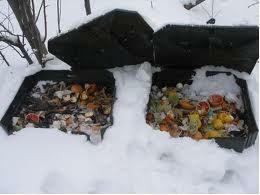 In fact with the right preparation, composting in the winter is easy. Dare I say, easier than the rest of the year? 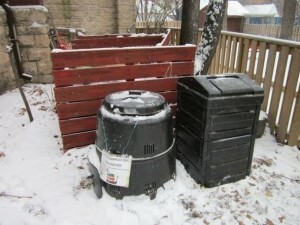 In the winter when everything is stalled, the rules of composting change. The important balance of greens (food scraps) and browns (leaves or shredded paper) becomes a little blurred. Since there is little activity in the pile, there is no need to layer with leaves or attempt to stir the frozen pile. If you run out of room in your compost bin or can’t access it, you can simply place a regular garbage pail (no air holes required) just outside your door and dump your food scraps. Depending on the amount of scraps you generate, you may need more than one. Since everything is frozen, there are no odors and no leaves are required. Easy peasy! When spring finally comes (don’t worry, it will, I promise) the food will begin to thaw and sink down into the pail. 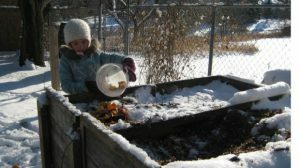 If you can get to your bin, you can transfer the contents periodically or as soon as the snow melts enough for you to move the pail, transfer the lot to your regular compost bin and mix with the stored leaves that you’ve saved from the fall. Et voila! The miraculous process of composting can begin again. What’s better, is the act of freezing and thawing helps to give the food scraps a head start at decomposition and once added to the pile with the carbon-rich leaves will quickly attract the micro-organisms looking for easily accessible tasty treats. Keep stirring and adding browns and greens and you will get beautiful, rich finished compost in no time. On another note, if your super keen and want to take composting to the next level you can continue to add the greens to your composter and layer with leaves as you go. The pile will build up, yes but it will shrink considerably in the spring. Check out our promotional video that was featured at the San Francisco Green Film Festival in 2013, highlighting one of our Master Composters and her love affair with dirt. How to Compost from Green Action Centre on Vimeo. And there you have it, the miracles of the Earth are at it again. Yay Winter!